Campaign Complete. This project has ended on February 5, 2019. No more contributions can be made. All funds will be collected by February 5, 2019. This campaign raised £1925 which was processed for the project, although the original goal of £9357 was not met, the funding is still going to the project. At the beginning of 2018 we ran a successful crowdfunding campaign on Crowd.Science that part funded the first phase of our research project to understand the impact of near-miss complications during labour on quality of life of the mother, the impact on society and health outcomes for the baby. We raised £6.7k from 90 supporters which was both heart warming and made the continuation of the research project which had already started possible. So far we have interviewed more than 350 women who had severely complicated pregnancies or childbirths, following up with them 3, 6 and 12 months after discharge from the hospital. Our aim is to develop a deeper understanding of the impact a near miss has during labour and for this information to be used to develop policies that can help lead to better outcomes and support systems. The focus of this campaign is to raise the funding needed to complete phase II of the research project. 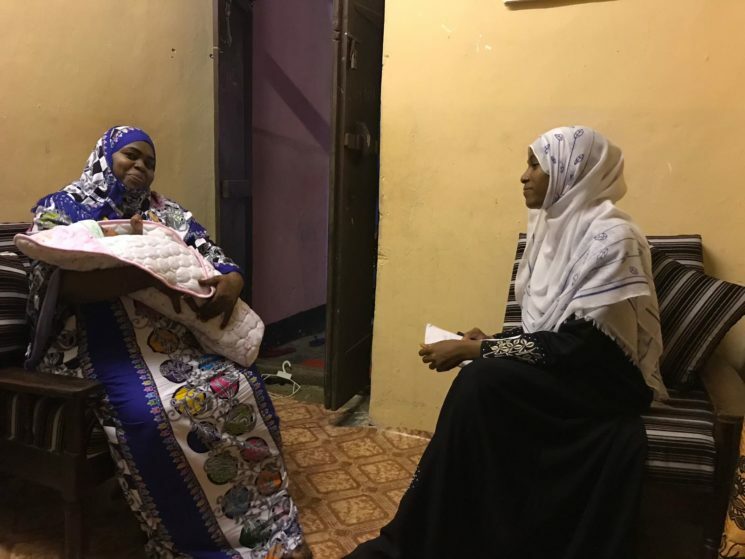 Image description: This is one of our research assistants Maryam Khamis, who is on a home visit to interview one of the study participants, who had a severe complication around her delivery in Zanzibar’s referral hospital, and is now back home with her healthy twin babies. Improvement of maternal health care has been on the priority list of policy makers around the world for decades. The 44% decrease in maternal mortality from 1990 to 2015, guided by the Millenium Development Goals, has been a major achievement for all involved. With currently declining maternal death rates, there is a growing attention for mothers who suffer from life-threatening complications but do survive. These so called ‘maternal near-misses’ are in one way a success story: they did not die. Nevertheless, these women will possibly still have to cope with physical and mental complications, in one of the most fragile phases of their reproductive age. On a societal level, this means that families and communities lose women with full potential and capacity, possibly resulting in social and economic issues. Zanzibar is a semi-autonomous archipelago of Tanzania, in the East African region of the Indian Ocean. It consists of multiple islands with the largest one being Unguja. In Unguja, there is Mnazi Mmoja Hospital, functioning as Zanzibar’s referral hospital, offering tertiary care services. Mnazi Mmoja Hospital’s department of Obstetrics & Gynaecology facilitates around 12,000 deliveries per year. On average, 1 maternal death occurs per week and there are 4-5 maternal near-misses. When looking at women who go through severe complications in pregnancy or childbirth, research tends to focus on the in-hospital setting and measures for improvement are aimed at the phase of acute care. Little research has been done into the actual long-term impact of these poor maternal health outcomes on women, their families and their communities. Impact can be measured in different dimensions, such as physical health, quality of life, disability, mental health, social life and child development. As mentioned previously we started our follow-up study into maternal near-miss survivors in April 2017. So far, we have interviewed nearly 300 women at three, six and/or 12 months after discharge from the hospital. We interview both near-misses and control participants (meaning patients who had a relatively uncomplicated pregnancy/childbirth). The interviews with the women take place in the hospital, or, when she is unable or unwilling to come to the hospital, at their home. Near-miss survivors in Mnazi Mmoja Hospital are included in the study, after they have given informed consent, until 31 October 2018. After that, there is a one-year follow-up period remaining. We believe that a true understanding of the impact of severe morbidity on the life of a woman will help improve maternal health care in three main ways. The quantitative and qualitative outcomes will add weight in addressing policy makers and stimulating change of a health care system in order for it to give better outcomes. It gives women, who often have an unheard and unvalued voice, a voice that is potentially very powerful in identifying the fragilities of health care systems that can be communicated with people making the policies, who may be unfamiliar with the current challenges, in a scientific way. It will reveal problems that women are coping with that are actually quite addressable, for example: women with symptoms of depression or post-traumatic stress disorder could be referred to mental health care, women with disabilities that hamper daily activities could get training in physical or occupational therapy and women with ongoing hypertension could be referred to the medical clinic. 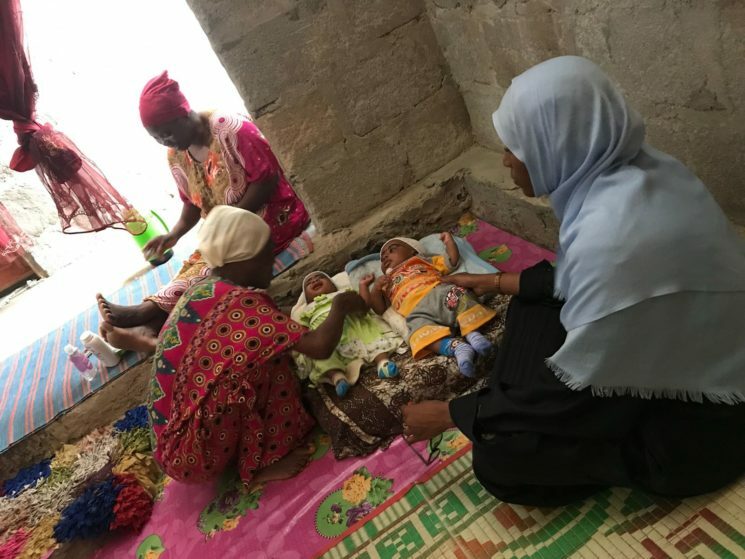 Image caption: Here we see Maryam Khamis on another home visit with a women who survived her complication, and is now back to her daily life, with her health baby girl. We hypothesize that we will find poorer overall physical and mental health in women who were in a life-threatening situation in the hospital, compared to women with a relatively uncomplicated pregnancy and childbirth. An example of this would be that we expect to find higher rates of depressive symptoms amongst women who had a severe complication. Furthermore, we think this group of women will experience a lower quality of life and a higher level of disability. In addition to that, other research suggests that the child, if it survived the complicated pregnancy or child birth, still has a higher chance of dying in the months and years following. On another level, we expect to be able to reflect the women’s feelings and needs and use their quotes and suggestions in order to show a more qualitative image of maternal health in Zanzibar. The first phase of the research study, in which we have included near-miss patients as study participants, will end on 31 October 2018. As mentioned, this first phase has been partly funded by a successful Crowd.Science project. After this, we will continue follow-up interviews for another 12 months, until the last included woman has been followed up upon 1 year after her discharge from the hospital. This means that from 1 November 2018 until 31 October 2019 we will need less capacity for the research project. What we do need is to maintain a follow-up team of 3 research assistants to perform the 3- ,6-, and 12-months follow-up participant interviews. We are looking to raise the remaining £9,357 through crowdfunding and sponsors. You can make a pledge through this page and also introduce the project owner, Tanneke Herklots to organisations who may have an interest in helping fund this project. In addition, helping spread the word about the campaign through social media, emailing it to your friends and peers and talking about the project will really help us reach the goal!